I can easily say that Warton Freight Services are an efficient and reliable choice for all our external haulage needs, booking transport with them is always swift and easy as well as professional. They provide a vast range of different vehicles to suit our needs and we have built a strong working relationship with them in the process. 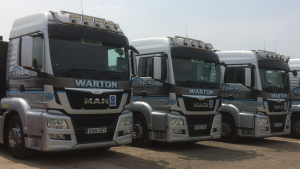 Warton Freight Services is a family run business which has grown to be one of the capitals largest Haulage fleets. Since starting in London’s East End in1991 it has been Providing Lorry Loader hire, and Contract Lifting solutions as well as transportation to the Plant hire and construction industries. Steve Barclay managing Director, Heads up Warton Freight, the company is based in West Thurrock close to the M25, Steve explains how Warton Freight Services have since joining FORS achieved reductions in fuel use, CO2 emissions, lowered NOx and Particulate Matter emissions they have also improved road safety, decreased Road traffic incidents and transport related fines & PCN’s. Our FORS journey started at the end of 2011 when we originally learnt about FORS while we were doing a lot of work on the Crossrail project, it became obvious that we needed to step up to the mark and show our commitment to the changes being asked of the whole of the transport and logistics industry. We already had a comprehensive Management System in place, this helped us to achieve the Bronze standard first time, following on from the Bronze assessment we were keen to progress to Silver as several of our customers were demanding it as a minimum standard, we achieved this in march 2013, we continued to work towards Gold which we achieved in 2015, we have recently passed our Bronze and Silver re-assessments. Once we were Bronze we really made the most of the benefits on offer, in particular the driver CPC training and FORS practitioner workshops, we also enjoy the benefits of driver licence checking by Advanced check (FORS accredited). We have appointed a company fuel champion and he has implemented several fuel saving initiatives such as an anti-idling policy we have since seen improvements in our fuel consumption figures. Our initial reason for progressing from Bronze to Silver was pressure from our customers, several of which had put in place a silver minimum standard as a pre requisite for hauliers working for them, we found that the extra work we had put in was worth the effort, we decided that we should progress to Gold because every step we had taken so far had improved our business and our performance regarding incidents, PCN’s, fuel, emissions and general compliance, it was an obvious step for us to show how far we had progressed. Over the last year we have stepped up our fleet replacement program to enable us to be fully Euro VI compliant by April 2019, we have retrofitted low level door windows to ALL of our fleet vehicles, all new vehicles are specified with these windows, overall we have improved our fuel efficiency by 4% and reduced PCN’s by 16.8%, our incident per 100,000km level has remained the same at 0.57 incidents per 100,000km, we are hoping that the fitment of the low level windows and next generation four and five way camera systems that we are fitting will reduce incidents. Warton Freight are members of and support both the road to logistics and Job Centre Plus schemes. All fleet vehicles are assessed for the amount of noise they make during their day to day work, measures such as air system silencers, low noise tyres and anti idling policies all help to reduce the amount of noise we make. The whole team at Warton Freight Services are dedicated to making the company the best it can be and we are extremely proud of the commitment in all areas that everyone involved in the business has put in, we are always assessing and trialling new technologies to further improve our overall safety and efficiency. over the last two years we have retro fitted low level windows and new High Definition camera systems to all of our existing fleet vehicles to further improve visibility from the driver’s position. Maintaining the FORS Gold accreditation will re-affirm what we have achieved so far, our aim is to continue making improvements in all areas of our business and continue to be London’s best Haulier.